My love affair with St Andews and the Old Course began in 1964, and to this day, St Andrews remains one of my favorite places to visit and the Old Course is still among my favorite places in the world to play golf. Once you get there, meet the wonderful people and play golf, you understand what it is – one of the most beautiful places in the world. In this book, John transports you to the magical lands through the eyes of golf’s greatest icon – the Old Course Starter’s Box – and gives a revealing portrait of the icon’s sale, the town and a ‘wee’ bit of history and lore. Bob Jones often said that if a golfer is to be remembered, he must win the Open Championship at St Andrews. 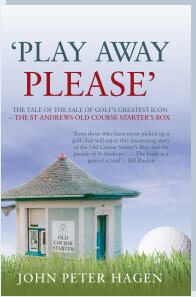 This book is a way of remembering the honesty and integrity the game of golf represents – and stirring the passion in every golfer to make the pilgrimage to St Andrews.